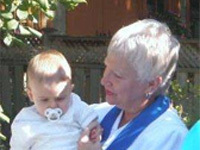 Naming or Welcoming Ceremonies are non-religious or secular celebrations where families state their love and commitment to their child and their intention to support them throughout their lives. It is also a perfect way to welcome and celebrate the addition of an adopted child or stepchild. 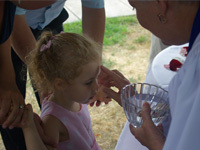 Often older children are included in a special blessing recognizing the important role they play. This experience is meant for the family as a whole, whether the parents are married or unmarried couples, single parents or gay or lesbian couples. Four Seasons Celebrations now offers a well-appointed space for intimate gatherings or events. For a personal consultation, please contact Mary@FourSeasonsCelebrations.com or by calling 905-377-8585 or 1-855-466-9570 (Toll-Free). Thank you so much for performing our son’s baptism. 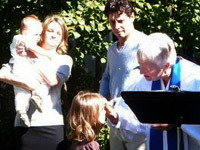 It was a very special day because of you and we are so pleased with how the ceremony unfolded. Considering that we had never met before, it was amazing that we all felt so at ease with you, like we had known you for years. We were glad that you felt it was important that we could have input into how the ceremony would be conducted and happy to see that we were on the same page when we received our first draft from you. Again, another testament to the way you were able to understand our needs and make us feel comfortable. Your idea to bless our eldest daughter Ava, as well as bless our son Dylan, helped to make the day about our family inclusively and Ava was thrilled to be able to have her own part in the ceremony even being able to say ‘I will’ be a good big sister who will love and guide my little brother. We received so many compliments about you and how lovely your ceremony was – no one could believe that we found you on the internet! After a conversation with a friend who had a baptism ceremony in her yard, did I seriously consider this for my daughter as well as myself. Some were skeptical, but after meeting Mary, I was convinced I had made the right decision. Mary was not only charming but very personable. She made us feel so at ease and gave a very beautiful and emotional service, with memories that will last FOREVER.